Mr. Speaker, DO. YOUR. JOB. MR. HICKEY: I rise today to provide this hon. House with an update on the Northern Strategic Plan for Labrador. This five year, dynamic, cross-departmental plan provides a clear focus of the Williams Government’s pledge to provide a better future for all Labradorians. MR. TAYLOR: Mr. Speaker, none of this – I say again, none of this - would have happened, number one, if the members opposite, in their infinite wisdom in 2000, had not kicked the Auditor General out of the House, and none of this would have been done – uncovered, identified – and none of the prosecutions would have taken place, none of the charges would have been laid, none of this would have uncovered and laid bare before the people of Newfoundland and Labrador, had it not been for the election of 2003 when Premier Williams and this government were installed in this place as the government. Do you agree with the premier that the Cameron inquiry appears to be more of a `prosecution' than an inquiry? Why or why not? Comments: The monies being wasted on the enquiry would be better spent on the Health Care System.The damage is done, those suffering will most likely continue to suffer for a long, long, long time. Comments: I said yes but then it should be a prosecution while not a crime under the criminal code, people messed up in a big way. Having said that, what are we going to benefit by draging this on? It's clear that the system needs a major overhaul and thats that. What's done is done and there's nothing more to be gained by draging it on. another waste of our tax money. Comments: Yes I agree with Williams. He was the one that called for the inquiry in the first place, and this inquiry could go on for ever and we are not going to learn anymore than we already know. I believe it was the laxadasical work of all involed that led to this, so how are we ever going to find out who and why, too many people were involved, perhaps all of Eastern Health all the way down the line, from the technicians, doctors, supervisors, and ministers. Now what can be cleared up with that. I believe that this inquiry has been going on for far to long, and nothing has been found out or ever will be, so what's the point in it all. The longer it goes on the worse it is for all concerned especially the patients and the famalies. Let it go and stop trying to find the blame, it will never be found, and do what has to be done to help in which ever way possible for the patients and famailies. This is a waste of time and money. Compensate the people and try to get the matter settled. Where is this getting things really, if it were to go on for years it will never get to the bottom of it all, so what is the point in prolonging it. Williams is not to blame for this, he was not the one to examine the results of the tests done. As I said it goes all the way down the line. Blaming whom ever is not the answer to this, a solution is the answer. Comments: yes, I am not big on inquiries, in a lot of cases we are spending more money than what was wasted but in this situation an inquiry is necessary to correct the problem, and make sure it do not happen again. I feel that this inquiry is being conducted more has a witch hunt rather than a fact finding inquiry. I don't know what it is about Mr. Coffey but he irrates the hell out of me and I have to turn it off, I would not want to be a jury listening to him. What I find very ironic, Mr. Speaker, is the persistence by not only the Leader of the Opposition but the Government House Leader in the continuous questions in this House, bringing into question a decision that we made about a location of a service in Grand Falls-Windsor. An attack, I say, Mr. Speaker, it is nothing more than an attack on the people of Grand Falls-Windsor and the people of Central Newfoundland and Labrador, as if it is a place no one would want to work. What I find very ironic, Mr. Speaker, is the persistence by not only the Leader of the Opposition but the Opposition House Leader in the continuous questions in this House, bringing into question a decision that we made about a location of a service in Grand Falls-Windsor. An attack, I say, Mr. Speaker, it is nothing more than an attack on the people of Grand Falls-Windsor and the people of Central Newfoundland and Labrador, as if it is a place no one would want to work. Again I am somewhat bewildered by the nature of the questions and the persistence, Mr. Speaker, of members opposite. It is truly remarkable, how, whenever the question turns to anything that might result in greater scrutiny of The Regime, the sock-puppets emerge on the internets to object to the potential costs as a "waste of money". Should the NDP be given official party status in the House of Assembly? Comments: No, No and NO. Waste of tax dollars. Comments: Its easy to want something, when its coming from our pockets at no cost to you. This is basically Lorraine Michael's request. I think we have heard enough of our money being squandered and wasted this past few months. If she wants status let her earn it. VOCM creates its own YouTube feed. The way I see it is that an investigation will be a complete waste of money! Ed Burne used money illegally and is already in prison for that. This is a crime which has ALREADY been dealth with through trial, a guilty plea and a prison sentence. So if you are not trying to investigate the illegal act of the money involved, what are trying to investigate and solve? The potential of an illegally won election??? Let us say that the money did actually affect the election results... what are we to do? Since this time there has ben another election and a new member is sitting in that seat! The opposition has another bone to chew. Byrne is in prison. A useless investigation and a possible by election would change nothing except cost us millions of dollars. The opposition is like a dog under the dining room table, looking for crumbs to chew on. I'm a taxpayer and I have no interest in having my tax dollars used to conduct a futile investigation into this matter. What do those calling for an investigation really hope to accomplish or discover? Obviously money was used inappropriately, Ed Byrne revealed that, what else is there to learn? This is in the past, leave it there. There is nothing more to be gained from this and only good tax dollars to waste. Note the VOCM-esque plea to consider the taxpayer's sweat-soaked loonie, and, in a remarkable parallel to what Minister Blunderdale said earlier today, an appeal to the faulty logic of how the election result wouldn't have changed. David in NL even notes that the MHA elected at the by-election in question has since been returned — the same argument that the former President of the PC Party made scant days ago. The bumper harvest of red herring continues. Is FishAq worried about a glut yet? I mean, we’re speaking to the integrity of the man, particularly in this circumstance, and our confidence in his ability to put his partisan politics to one side. And we believe that he’s done that. It is his conclusion that, y’know, there is no evidence to support at all that it would have affected the outcome of that by-election. Way to stick to the talking points. And way to (deliberately) miss the point. Ed Byrne won't be legally allowed to drive for the next eighteen months, what on account of the impaired driving conviction and all. On the basis of the above, I conclude that any impropriety involved in the 2001 St. Barbe by-election was related to the actions of Ed Byrne, actions for which he has been convicted, and are not attributed to other persons involved in that by-election. There is no evidence presently available to support a contention that the outcome of the by-election was affected by these actions and no formal investigation is required. The RNC shouldn't have bothered with an investigation of the impaired driving charge, and the court shouldn't have bothered to hear the case, let alone convict, much less apply a sentence. After all, Ed Byrne has already plead guilty, and been sentenced, on account of something. And there's no evidence that his impaired driving could have affected the outcome of the by-election. Stop the money-wasting investigations. Leave Ed Byrne alone! MR. KELVIN PARSONS: I ask the Premier: Will Mr. Byrne be repaying this money pursuant to the restitution order, or will the PC Party of Newfoundland and Labrador be reimbursing the taxpayers for money specifically used for PC Party operations? MS DUNDERDALE: Mr. Speaker, just let me begin by saying that the Chief Electoral Officer is an officer of this House and we have every confidence in his ability to deal with this matter. MR. KELVIN PARSONS: Mr. Speaker, these instances are in the Agreed Statement of Facts relating to this case and there may well be many other examples of inappropriate expenses that have not been uncovered or reported. I ask the Premier and the government: Are you willing to support an independent third-party investigation into election campaigns, to determine whether any other inappropriate funds were channeled to the Progressive Conservative Party of Newfoundland and Labrador? MS DUNDERDALE: As I said in my earlier answer, we have every confidence in the Chief Electoral Officer and his ability to deal with these issues. If there was impropriety it was not by the PC Party of Newfoundland and Labrador. MR. KELVIN PARSONS: Mr. Speaker, in other areas, as I say, where we have had issues: in health care we asked Justice Cameron, if it was Justice we asked Justice Lamer to come in, and if it was the case of the House of Assembly we asked Justice Green to come in. I ask the Premier: Why are you so adamantly opposed to a third-party investigation that protects the Province’s electoral laws and would identify any abuses that have occurred? MS DUNDERDALE: As I said, Mr. Speaker, we have every confidence in the Chief Electoral Officer’s ability to deal with this issue, we have every confidence in the Auditor General and his ability to audit MHAs here in this House to ensure that funds are spent appropriately, and we have every confidence in the courts of the land to deal with any improprieties or legal misdoings that may have taken place. All of those processes, we feel, Mr. Speaker, adequately protect the people of the Province. That's the kind of language that a Premier — or Deputy Premier, in this case — would use to defend someone who has to enjoy the confidence of government, not of the House. And that's a problem. Where's Duff Conacher? (And where's the Premier, anyway?) In fact, that is exactly the problem that about five people pointed out would inevitably arise when the former President of the PC Party was named Chief Electoral Officer. But, if Kathy Blunderdale is claiming to speak for the House, perhaps the House should have a vote. Restore our trust and confidence — is that the phrase? MS JONES: Yes, it is exactly what I was looking for so I am glad that you referred me to it. I am just going to run down through those positions now for just a moment. First of all, according to this, the Premier receives a salary of $78,202. I guess that is on top of his salary as an MHA, so that would be the salary he would receive as the Premier. So that salary of $78,000 to the Premier is being paid out from the public purse. Because there was a lot of public commentary that the Premier was not taking a salary, but according to this he is receiving $78,000. MR. KENNEDY: Mr. Chairman, I will have to check on that. It is my understanding, again from talking to a couple of my hon. colleagues, that the total of the Premier’s salary is received but it is donated. That includes both his salary as an MHA and what would be here as his salary as the Premier. Again, I can check on that but the Deputy Premier is indicating that is correct. MS JONES: So he is being paid a salary, because I think there is a lot of perception out there that the Premier of the Province does not take a salary. What he does with it after, I guess, is really not my business. My business is just that: Does it come out of the Estimates of government or does it not? I am just noticing here that it does come out of the Estimates of government and that there is a public salary paid out. It is like all of us; what we do with our salary when we receive it is entirely up to us. It is really not of business to the public. The only business to the public is that we get paid what we are supposed to get paid for the jobs that we do. The Chief of Staff, according to this – first of all, the Parliamentary Assistant to the Premier, it says here they are paid $28,000. Do they work part time? Do they receive salary for another position within the office? Or, Mr. Chairman, this is the amount that is paid out to the appointed MHA, I am assuming, Mr. Chairman. I am assuming it is paid out to the appointed MHA who would be the parliamentary appointed Secretary to the Premier and it would be an additional salary that they would receive over and above their MHA salary. I just wanted to verify that is correct. MR. KENNEDY: Mr. Chairman, first, again, I think the Leader of the Opposition knows better in terms of the Premier’s salary. It is my understanding that Finance told him he had to take the salary in order to donate it to charity, which is essentially what he does. To leave any other impression, I would suggest, Mr. Chairman, is not fair. The Premier’s salary is provided to, I think it is the Williams Family Foundation, which then distributes it to charity. The Premier of this Province does not receive one cent to himself for the benefit of what he does. Unlike the rest of us, or at least unlike me, I use my salary to live. Why is The Most Open And Accountable Government In The History Of Ever so reticent to post the text of its legislation to the intertubes? Of the nineteen bills enumerated on the ever-so-busy legislature's calendar, a grand total of three are available online. One of them, the Apologies Act, was introduced at first reading as Bill 1 more than a month ago. 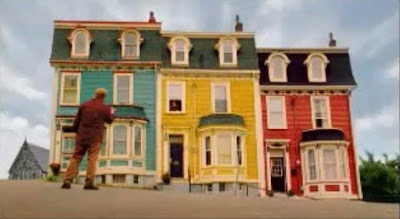 This is a capture of a frame of the TV ad referred to in Geoff Meeker's posting highlighting the extensive photo-manipulation done to much the same scene in a direct-mail tourism promotional piece. Notice how the genuine imitation tree to the right of the red house in the direct-mail image dressed up as a genuine imitation bush for its appearance on the TV. The red house has also lost its former chimney, and acquired a new one, modelled on that of its neighbour, the yellow house. "How many Quebec Innu hunters have been charged to date?" the radio host fustigates. "I think I know the answer: NONE." The province had promised the college in Corner Brook, a campus of Memorial University of Newfoundland, that it would become an autonomous university by the fall of 2008. Burke said Friday that will not happen for another year. "We are just at the point, I guess, with a busy schedule in the house of assembly and certainly the tedious work in developing the legislation, that we didn't have sufficient time … for the full debate that it deserved," Burke told CBC News. Since last July, the House of Assembly sat for seventeen days in First Session, and a whopping nine days so far in the Second. For those, like the former Minister of Education, who are good at math, that's 26 days in total, several of which were occupied with formalities like Throne Speeches and budget speeches. And when the House comes back on Monday, after a two-week break, it will likely be for only another five or six weeks of four-day sitting weeks, with at least one more mini-holiday break coming up in late May. And it's not as if the legislative calendar is chock-a-block with business. So, is the real problem with getting the Grenfell bill through that the Legislature is too busy... or that it's not busy enough? In short, Dr. Darin King, what will your excuse be, come July? The rocky, snow-covered bluff, if it exists at all, is not where the "photograph" suggests it does (which is in fact the edge of a gravel moraine hill). It's also possible that the snowmobile and people are an entirely separate element also 'shopped in. And, for good measure, the palette of the original background photo is suggestive, though by no means conclusive, of a daylit shot whose hue, saturation, and values have been tinkered with to impose an artificial night aura. Here's an untampered photo taken from within a few feet of the same vantage point — you can even identify individual trees which are the same in both images. David from NL writes: While I agree Reynolds is biased, I think it would be an absolute waste of taxpayers money to investigate. The amount, if it was properly added to Tory election spending accounts, would not have exceeeded the limit. How then, can anyone think the election results would have been different? And investigate so Byrne can be charged again? Give me a break. He's in jail and it serves no purpose other than to waste mo0re taxpayer's money. Had [former President of the PC Party Paul] Reynolds seized upon the matter and quickly granted the investigation, suspicions of bias would have been dispelled and his integrity never questioned. He could have used the issue as an opportunity to advance the cause of his office, and the Tory government. It was the Williams administration, after all, that touted accountability and transparency as prime reasons why they should have the reins of power. Yep, Randy Simms blew it. However, our people have now also learned that we will achieve self-reliance economically only by taking charge of our future as a people. To that end, My Government will harness the desire among Newfoundlanders and Labradorians to cultivate greater cultural, financial and moral autonomy vis-à-vis Ottawa. If the current Federal Government is not prepared to represent the best interests of provinces like ours, then we as a province will protect our best interests ourselves. To lower tariff barriers to our exports while safeguarding our fish stocks and securing markets for our seal products, we will speak up on our own behalf on the international stage and work to effect progressive agreements that take our best interests fully into account. Is Abitibi's NAFTA challenge of the Danny Williams Legacy Expropriation Act, 2008, one of those cases in which Our Dear Government will harness a desire for autonomy from Ottawa, and speak up on Our own behalf on the international stage? A former Chief Electoral Officer is indicating he would investigate the matter surrounding the 2001 St. Barbe by-election. Chuck Furey now calls Dominica in the Caribbean home, but responded to VOCM News by e-mail saying that as former Chief Electoral Officer he would "have investigated the matter and for 100% transparency, appointed a retired judge to look at the entire matter and make recommendations . I would have bound myself to the judge's recommendations". Furey says he has a great deal of respect for his successor, Paul Reynolds, and says it is entirely his call under the Elections Act. The opposition has called on the Chief Electoral Officer to investigate the 2001 St. Barbe by-election after it was revealed in Ed Byrne's Agreed Statement of Facts that he had paid a campaign worker in the by-election with money from his constituency allowance, for which he was fraudulently reimbursed. Paul Reynolds has indicated that the matter was dealt with through the courts, and that Byrne has been convicted and sentenced on the matter, and no further investigation is warranted. Let's see... ODP, wherever he is, disagrees with Chuck Furey and stands by the former President of the PC Party. There is nothing to look at in St. Barbe 2001, move along. And he can't very well dismiss Furey's comments as coming from a partisan hack. What clever grounds will He come up with to dismiss them, then? Reynolds is a former president of the provincial Progressive Conservative party and that is adding to the controversy. It's a perfect case of a political crony getting a job on the public payroll that should be held by someone who at least appears impartial. Yesterday’s VOCM Question of the Day, “Should the Chief Electoral Officer investigate the 2001 St. Barbe by-election?”, received 31,476 “votes”, of which 63% voted For The Province. This falls just short of putting it in the all-time (since February, 2005) top ten list for largest number of “votes” cast. It ranks just ahead of November 27, 2008’s “Do you think the premier is bullying public sector unions?” (30,497 “votes”), and January 30, 2009’s “Do you agree with the Williams government's move to take the 20 per cent template off the table at this time?” (29,647 “votes”). It fell a bit short of November 23, 2006’s “Do you think there should be an independant [sic] inquiry into the Fibre Optic Deal approved by government?” (32,046) and, six days later, “Should the official opposition drop the fibre optic issue?” (31,742). Interesting how investigation-related questions become so hot. The magical elves at the Office of the Chief Electoral Officer have been very busy yesterday afternoon and this morning, finally converting the contributions and expenses reports from the by-elections held this decade into useful PDF documents, and posting them online. Some of them even go back as far in time as 2001, eight years ago, a time period in which it is politically incorrect to have any interest anymore, if the talking points are to be believed. The Elections Act, 1991, establishes that both candidates and political parties are subject to expenditure limits for their election related expenses, the purpose being to provide as level a playing field as possible in prohibiting any individual party or candidate from spending in excess of the legislatively permitted amount. For the 2001 St. Barbe by-election, the expenditure limits for both the political party and for individual candidates was $25,743. The reports filed on behalf of the PC candidate in the 2001 by-election and by the party indicated election expenses totaling $17,362. Even including the amount of $3,000 identified in the statement of facts released with respect to the Ed Byrne criminal proceedings, neither the PC candidate nor the party would have exceeded the legislated expenditure limits for the electoral district in that by-election. Very good. Chief Electoral Officer, and former President of the PC Party, can read the Elections Act. 306. (1) No person other than the chief financial officer of a registered party or candidate shall authorize election expenses for that party or candidate and no election expenses shall be incurred except by a chief financial officer or a person designated in writing by a chief financial officer for that purpose. And you see, the thing is, the question is not whether the campaign expense limits were exceeded. It's whether campaign expenses were properly authorized and reported. Whatever the state of the other fisheries, the red herring stocks are healthier than ever. “A Steady Stream of Road Upgrades Keeps Flowing,” crows Trevor Taylor’s latest press release, touting the benevolence of Danny Williams-Government, and the skill of His Minister’s urologist, in the electoral districts of Placentia-St. Mary’s, Bellevue, and Grand Bank. “Road Improvement Momentum Continues,” proclaimed Trevor’s previous effort on behalf of Danny Williams-Government, in the districts of Conception Bay East-Bell Island and Cape St. Francis. “Provincial Roads Program Keeps Rolling,” was the motion-related metaphor of choice in Trevor’s outing the previous day, playing up Danny Williams-Government’s unprecedented blah blah blah in Straits-White Bay North, Ferryland, Terra Nova, and Gander. “Beneficiaries,” they are known as. 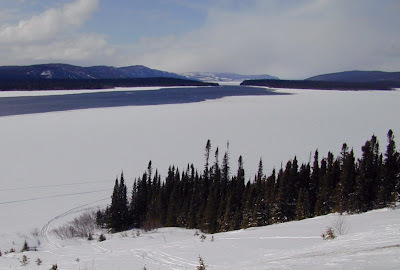 Danny Williams-Government, Trevor Taylor, Minister, announced “Lays Out More Road Work” on April 9th, bestowing its benevolent beneficiary status on the good people of Grand Falls-Windsor-Buchans, Fortune Bay-Cape La Hune and Harbour Main districts. And it all began for the year on April 3rd, when Danny Williams-Government, under the rather prosaic headline “First Projects Tendered Under 2009-10 Roads Improvement Program”, began rolling out the stream of momentum in “the Bay of Islands” (which has acquired a definite article, perhaps from the same place that capitalizes the word Government), St. Georges - Stephenville East, Isles of Notre Dame, and Bonavista North. Sixteen districts down, sixteen or so to go. The Provincial Roads Improvement Program will create an estimated 1,400 person years of employment and is part of the Provincial Government’s infrastructure strategy, valued at more than $4 billion over the next several years. As part of Budget 2009, the Williams Government will invest over $300 million in transportation infrastructure. The Provincial Roads Improvement Program will create an estimated 1,400 person years of employment and is part of the Provincial Government’s infrastructure strategy, valued at more than $4 billion over the next several years. The only dollar figures mentioned in the releases are the vague “more than $4 billion”, over the equally vague “next several years”, and “$300 million in transportation infrastructure” as part of Budget 2009. That is to say, in sharp contrast with the practice of previous years, Danny Williams-Government isn’t highlighting the funding allocated on a district-by-district basis, go-forwardly. What on earth could be the reason for that? Hmm? Comments: to do so would be another waste of the taxpayers dollars! come on liberals smarten up! there are no halos around any of your heads! as for roger grimes, you failed as a leader so get over it!! Comments: no more waste of taxpayers''money,put it to rest, and let ed enjoy his time in jail,i hope they keep him in for the 24 mo.less a day. Comments: no i don''t think we should be wasting taxpayers money on an investigation. although it would be interesting to check out the liberal ministers'' travel expenses at that time. but if an investigation were to be held i would like for it to be deep. also it is time for grimes to get over the fact that he lost government and go golfing or whatever he does. Comments: no that would be a make work project for the government to waste more money on!!!!!!!!!!!!! Comments: no no no! !do not waste anymore of our money!!!! Comments: waste of time and money. if the liberals really want to investigate something it should be how and why their party chose roger grimes to lead the liberal party. Comments: why so they can waste more money, get real time to grow up. Comments: you lost,its a waste off tax dollars. Comments: no need to waste any more of taxpayers money. nothing won''t change. it is high time for grimes to accept defeat and grow up and be a big boy. Comments: there is enough waste of tax payers dollars !!!!!!! Comments: yes!! lets waste some more money on an investigation that will do nothing!! how about we have an investigation next into the colour choices for the rooms when that was built. come on people, get over it, move on, and focus on the future, not the past that you can''t change. appearantly the opposition can''t find anything else to oppose, so why not grab at things that happened 8 years ago. Comments: no, grow up! do you think it would make one ounce of difference? don''t waste my tax dollars on this foolishness! Comments: no, why waste more of our tax dollars on this. will 1 more lberal make a difference? come on liberals find something worthwhile to to shout about. have you not heard of the spilled milk yet? grow up! Comments: that''s 8 years ago! can''t we find better things to waste money on?!?!? Comments: can someone explain what is going to happen eight years after this happened. what is going to change? another waste of tax dollars. Bonus points for the repeated references to how "it was eight years ago", and the barrage of invective against Roger Grimes. Inquiring minds, of course, will scurrilously wonder if this is the clever and witty work of just one person on the Eighth Floor... or of multiple of Danny's Minions? PS: the "vote" count is now up to 27,647— an increase of over 8,000 since 9:33 PM DannyStandard Time this evening. That's nearly one "vote" per second all night, driving the "no" total up to a much more Premier-positive 71%. That should put a smile on His face... wherever His face is tonight. Comments: i have two questions for those who voted yes to this question. did ed byrne admit that he did give that person money? secondly, hasn''t that same mha been re-elected twice since that by-election? what would an inquiry achieve? other than waste money and give the liberals another topic to rant about? if, the answer to those two questions were no, then an inquiry would definately be necessary. Comments: perhaps if that by-election had had a direct result on the current make-up of the house, but there have been two general elections since, and mr. wally young was re-elected both times. chances are, during the 2 huge influxes of pc members during the past two general election, mr. young would have been re-elected even if he hadn''t been successful in the by-election in 2001. Comments: i said no because there has already been elections held since 2001 - so what is it going to prove. if the area wanted to elect someone other than the current elected official - they would have done so in the last election. stop wanting to waste money people and start putting it somewhere useful. Where have we heard that argument before? Oh, right: from the former President of the PC Party. The VOCM Question of the Day is as reliable a barometer as any of the way the political wind is blowing around the Eighth Floor of the middle finger of Confederation Building. Today's question? "Should the Chief Electoral Officer investigate the 2001 St. Barbe by-election?" As of right now, that question has received 19,625 "votes", a total which is increasing by over 100 "votes" per minute. Reversing the embarrassing trendline which was shaping up earlier in the day, 65% have now "voted" no. The Public Ledger, authored by a well-known traitor or some such, comes out of hiatus. Premier Danny Williams is standing by the Chief Electoral Officer. In a statement sent to the CBC, the government says the Premier has no intentions of asking for Paul Reynolds to resign. The Liberals and the NDP have been calling for that since Reynolds refused to investigate the 2001 by-election in St. Barbe. That came after Here and Now revealed how Ed Byrne had used illegal money to make secret payments to a worker in that campaign. But Reynolds says there’s no reason to hold a formal investigation because there’s no evidence that anyone other than Byrne did anything wrong. The government says it respects Reynold’ conclusion, and considers the matter resolved. Observation 1: Why is the Premier in a position where he has to decide whether or not to “stand by” the Chief Electoral Officer? Oh yeah – because he turned the position into a patronage job. Observation 3: “the government says the Premier has…” The government says? Really, now: where’s Danny? Observation 4: “The government says it respects Reynold’ conclusion, and considers the matter resolved.” Translation: The PC government says it respects the former president of the PC Party’s conclusions about the conduct of a PC campaign. How very convenient that it now considers the matter resolved. And finally, out-of-sequence Observation 5: “the Premier has no intentions of asking for Paul Reynolds to resign.” Good. Because the Premier has no business asking Paul Reynolds to resign, even if, by appointing the former President of the PC Party to the job, the Premier turned a non-partisan office into a patronage job. 4. (1) There is established the office of the Chief Electoral Officer to be filled by resolution of the House of Assembly. (2) The Chief Electoral Officer holds office during good behaviour and may only be removed by resolution of the House of Assembly. It sure would be awful if an MHA laid such a resolution before the House. In the 2007 general election, 6 NDP candidates, 29 Liberals, and 47 Progressive Conservatives reported “Salaries & Benefits” in their election finance filings. The largest Liberal S&B expenses reported were Isles of Notre Dame($8725), Port de Grave ($8165) and Trinity-Bay de Verde ($5750). The best-paid PC campaigns were reported again in Isles of Notre Dame ($8710), Signal Hill-Quidi Vidi ($7075), and Lewisporte ($7000). It’s almost as if all stops were pulled out to defeat the incumbent party leaders at any cost, or something. The Osborg reported a total of $13,640 in total salaries and benefits in their re-election campaigns in St. John’s North, South, and West. On the flip side, the Reids in Mount Pearl reported a combined $400 in salaries and benefits in their faint-hope campaigns. And how, pray tell, is a body able to bandy these figures out? It’s one thing to be an acceptable and common occurrence. But to be a lawful one, is something else entirely. The following press release was issued by ITAR-DAN today, ostensibly at five minutes to five, DannyStandard Time. No one should be shot. Do not shoot anyone. Not even after learning that, the ostensible time-stamp notwithstanding, hours later, this "release" has still not been posted to the Dannystan Government website. When I was initially made aware of possible unreported election expenditures of $3,000 relating to the January 30, 2001 by-election held in the electoral district of St. Barbe, I initiated a review of the filings in question. As a consequence, I spoke directly with the Progressive Conservative (PC) candidate for the by-election and PC Party officials regarding what they knew of the situation. They indicated that they became aware of this issue when the statement of facts relating to the Ed Byrne Constituency Allowance fraud case was brought forward by a CBC reporter, this being the same time that my office was made aware of the situation. They also indicated that at the time the related finance reports for the by-election were filed, they were of the belief and understanding that all legitimate expenses relating to the by-election had been disclosed. As for the involvement of a PC Party worker in the election campaign, it is not only acceptable under the Elections Act, 1991, but a common occurrence during elections for candidates and political parties to pay campaign workers and organizers for their work and to reimburse them for their expenses incurred. As long as there was expenditure room within the established legislative limits, a party or candidate would have no reason to hide the involvement of a party worker who had received pay for their services. Also, in light of the fact that at that time campaign filings were not due until six months past polling day, any error or understatement of campaign expenditure that had occurred could not possibly be seen to have affected the actual voting that had taken place on January 30, 2001. The available evidence indicates no knowledge or involvement on the part of the candidate or party with respect to the actions of Ed Byrne. There is also no indication that the fraudulent actions on the part of Mr. Byrne affected the outcome of the 2001 by-election. Further, there is no evidence that anyone other than Mr. Byrne was involved in a deliberate attempt to manipulate funds or to otherwise fraudulently circumvent the provisions of elections finance requirements in the Elections Act, 1991. 2009 04 21 4:55 p.m. The talk radio caller from Bay Roberts says, on Monday night, "I know Danny Williams done some good things, I don't like to say this, but sometimes he act like a dictator." Now, I spoke with Paul Reynolds this afternoon, and he isn't changing his mind. He says at this point an investigation would prove absolutely nothing, and that, in his opinion, financial management rules were not broken. He also denies that his past political connections have anything to do with this. He says that he is doing his job, and he's doing it well. Where, oh where, have we heard this kind of self-fart-sniffing before? The radio host fustigates and froths in his comparison between the way fisheries are managed in France and in Canada. In Canada, meanwhile, the unlistening federal government was going to dole out shrimp to PEI, until politicians and the fishing industry in Newfoundland lashed back. French fishermen are gaining such little headway in getting what they want from their government that they are blocking ports and marine traffic. This anecdote shows how the French government listens. Newfoundland fishermen kick up a stink ("Speaking. Up. WORKS! ", the radio host sagely advises) against their government, and the government backs down. This anecdote shows how the Canadian government doesn't listen. Little surprise that the radio host is on an on-air first-name basis with a cabinet minister named Jerome. Neither of them lets evidence get in the way of a good anti-Confederate rant. According to the latest David Cochrane CBC radio report on the St. Barbe affair – sadly, not (yet?) online – former president of the PC Party, Paul Reynolds, who is now Chief Electoral Officer, has justified, at least in part, his decision not to investigate the 2001 by-election because – paraphrasing Cochrane’s paraphrase of Reynolds – the people of the district have twice seen fit to re-elect the MHA who was first elected in that by-election. Memo to all past, as yet-undetected, violators of the Elections Act, and to all future violators of the Elections Act (at least while former president of the PC Party, Paul Reynolds, holds the job): as long as you win, it’s OK to cheat. However, former president of the PC Party, Paul Reynolds, has yet to clarify whether this rule — call it the Reynolds Rule — would still apply in a case where the MHA was re-elected twice by voters who knew, before they voted, of a potential breach of the Elections Act. Seriously: Just when you think Dannystan couldn't get any more Dannystani, it does. AGAIN! La compagnie minière Iron Ore Company of Canada (IOC) a avisé le ministère du Travail de Terre-Neuve-et-Labrador que l'arrêt de production du 7 juillet pourrait s'étendre jusqu'en octobre. Si le marché du fer ne montre pas de signes de reprise rapidement, l'arrêt de production durera 13 semaines. W Bag from NL writes: I agree with Walter, Reynolds could have at least humored us with an investigation before making those comments, because regardless of the investigation, that would have been the conclusion anyways. I guess he was afraid, he would have to ride the pine at St. Bon's Forum. As much as I support Danny in some aspects, there are other aspects where, arrogance, nepotism, vengefullness and plain old bullying are the worst I've seen EVER seen in a democracy. John Eason from Victoria, BC writes: Part of the Danny Williams team, huh? So, what this say about Mr. Williams' character judgment, one has to wonder? I admire Danny from afar -- but maybe he's just human after all! Former president of the PC Party, Paul Reynolds, has no direct knowledge of the conduct of the St. Barbe by-election, or any other by-election before 2007, because he wasn't the Chief Electoral Officer then. Former president of the PC Party, Paul Reynolds, who was appointed Chief Electoral Officer in 2007, also has no direct knowledge of the conduct of the St. Barbe by-election by way of his investigatory powers and duties as Chief Electoral Office that he has since acquired, because he hasn't investigated that conduct. And so, having neither superintended that by-election then, nor investigated it since, and having ruled out investigating it, former president of the PC Party, Paul Reynolds, says, to paraphrase, "he will not be pursuing the issue any further and that in his view the St. Barbe byelection was conducted properly." Just when you think Dannystan couldn't get any more Dannystani, it does. The provincial government is worried about the rising Canadian dollar. Premier Danny Williams made the comment, amid word Abitibi-Bowater is into a 30-day review of its entire operation to try to cut costs, partly because of the soaring buck. Williams says the central Newfoundland mill is in a relatively good situation in that it enjoys a favourable power arrangement and has no issues with wood supply. Premier Danny Williams says he feels really good about the province and wants to build on that momentum. Williams is wishing everyone in the province a joyous Christmas season. Premier Danny Williams says the Lower Churchill is not a definite. He says there are a lot of hurdles to jump, and they will be a major focus of government over the coming year. 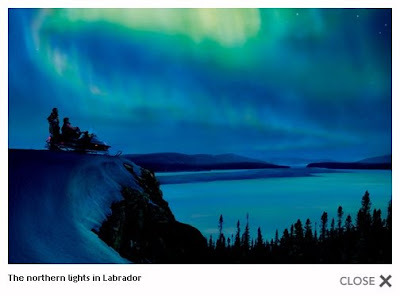 But he says on the other hand there are some really exciting projects in the works, including the anticipated signing of the Hebron agreement in the near future, a possible oil refinery in Placentia, an aluminum smelter in Labrador and the hydromet facility in Long Harbour. There is a lot of excitement surrounding this week's NOIA conference and Atlantic Canada Petroleum Show at Mile One Centre. Premier Danny Williams, who will be one of the guest speakers at this week's event, says he is getting a real sense of pride in Newfoundland and Labrador' s oil and gas industry. Williams says there are some fantastic partnerships being forged in this province with companies all over the world. He also says the provincial government is fostering strong relationships with the oil industry so that they will increase their investment here. Williams is optimistic there will be a lot more exploration off our coasts. Williams says it's the government' s goal to take the energy industry to another level. For the first time in the province's history, Newfoundland and Labrador has reached 'have' province status. Word that we would no longer receive equalization payments from Ottawa came Monday, as Provincial Finance Minister Jerome Kennedy attended meetings with his counterparts in Toronto. The status comes one year earlier than expected. Premier Danny Williams says we will be a 'have' province according to the equalization formula, for this year and next. However, with the volatility of oil prices and the dicey global financial situation, Williams says the future is hard to predict. Though oil has played a big part in reaching the milestone, Williams says other factors also played a role, such as source and commodity revenues, a booming housing market and a decrease in unemployment. 1) Provincial Government is Committed to Displaced Workers. In case you're still confused about which government, it's title-dropped four times: Provincial Government, Provincial Government, Provincial Government, Provincial Government. 2) And oh, lookie, "the Williams Government is committed to ensuring that" blah blah blah. That would appear to be the first time that Danny Williams-Government has let Our good name be associated with the Grand Fiasco. 3) "Premier Williams has been in touch with union leadership today assuring them that the issue of severance is a priority for this government." Why is Shawn Skinner saying that? Where's Danny Williams-Government? 4) " AbitibiBowater has an obligation to these people and the Provincial Government will take steps to ensure that severance is provided." The Provincial Government’s top priority in discussions with AbitibiBowater, the Federal Government, and potential trustees is to safeguard the interests of displaced workers... "Given the forestry’s overall importance in the national economy, there is tremendous opportunity for the Federal Government to support workers during this trying time," said Minister Skinner. "The forestry employs twice the number of workers as the automobile sector. With this in mind, I encourage the Federal Government to step up and provide similar levels of support." 6) Released at ten minutes to five on a Friday afternoon? No one should be shot, certainly not Scott Barfoot. MS FOOTE: I rise today to speak not just to the amendment but particularly to the amendment, I suppose, because we are talking about a really important position in our Province; that, of course, of the Chief Electoral Officer and the Commissioner of Members’ Interests. For anyone to suggest that this is a position that can be filled by anyone who has a party affiliation just as well as it can be filled by anyone who has maybe been a lifelong career servant is dreaming in technicolour, Mr. Speaker. I say that because the irony of all of this is that when the press release came out about the new Chief Electoral Officer and the Commissioner of Members’ Interests there was no mention whatsoever of his political affiliation. If it was not an issue, I do not know why it would not have been included in the press release under his biographical information. In fact, even Mr. Reynolds’ own biographical information does not include any of his political affiliation. That, to me, says volumes there, if it was something that somehow the government thought, well, maybe this is not such a good thing. This is a position that should be filled by someone who is non-partisan. Whether or not Mr. Reynolds can fill that role I do not know. I really do not know. I do not know Mr. Reynolds. The Member for Placentia & St. Mary’s just mentioned how long he has known him, how much he respects him, and - give him the credit. If he knows him, then by all means get up on your feet and say that, but at the end of the day you also have to appreciate that there are those of us who will be affected by whomever holds this position who does not know Mr. Reynolds and who cannot stand here and say that he is a great man, that we have no worries about whether or not he will be non-partisan. We do not know that, so why put any of us in a position where we have to question whether or not this gentleman will be non-partisan? Why go down that path when it is totally unnecessary? It is the position that we are talking about here, not the individual. We need someone filling this position who we can all feel comfortable will do the job that needs to be done. I think that when we look at democracy and the fact that this position must be filled by an individual who will have to ensure that our elections are run on the up and up, that it is beyond reproach, that when you are talking about a Commissioner of Members’ Interests, we need someone there who is going to look at the documentation without a jaundice eye, who is not going to say, well, look at this or look at that, or this person has this or that person has that. We all need to have that level of comfort, and that level of comfort comes with having an individual who is non-partisan, and that has been the practice since time immemorial. I point to Mr. Furey, our last Chief Electoral Officer and Commissioner of Members’ Interests. Yes, he was politically affiliated for quite some time. He was a Liberal Cabinet minister, but Mr. Furey had not been involved in politics for five years when he was appointed to this position. Now, that is quite different from Mr. Reynolds’ political affiliation when, in fact, he resigned from being I think it was the President of Virginia Waters PC Association the day after he was appointed to this position by the Premier. I say appointed to the position by the Premier because, even though it is here before us in the House of Assembly and we all get to vote, we know that majority rules, and even though there was a call that came from the Premier’s office - I am not sure who made the call, I know it was not the Premier - to the Leader of the Opposition, there was no consultation. There was no opportunity to express a view that: Do you think this is the right thing? We would prefer that you probably revert it to the process of having someone from the Public Service fill this position. That just was not the case. Now, I do not know Mr. Reynolds, and maybe you are right. Maybe, as the Member for Placentia & St. Mary’s says, he is an honourable man - I have no doubt about that - but I do not know Mr. Reynolds well enough to be able to stand here and vote for him as a person who should fill this particular position; and, if I do not feel comfortable about that, then I want to be able to voice my views on that, as I am sure other people do, and suggest to the government that here is an opportunity to do what is right here. When the Member for Placentia & St. Mary’s stood on his feet today and said: You know, there are more important things we should be dealing with - with all due respect to him, at this point in time this is what we are dealing with, and this is important. This deals with elections, and we have an election coming up in this Province in October. We should all feel comfortable, everybody in this Province should feel comfortable, that it is going to be handled in a manner that is beyond reproach. Anyone thinking this through would have to agree that, whether or not Mr. Reynolds can carry out this job in a non-partisan way, the perception is what is important here as well. For anyone, who knows what this job is meant to do, anyone who knows the duties and responsibilities of this job, anyone who understands that the person in this position will have to deal with every member in the House of Assembly when it comes to their members’ interests, their conflict of interest statements, anyone who knows that this particular position is so important in ensuring that elections are carried out in a manner that cannot be questioned so that at the end of the day the individuals who are elected as members to represent the interests of the populous at large, anyone would have to question whether or not someone with such close political ties will really do the job that needs to be done. Maybe he will. As I said, I do not know him well enough to know whether he will or not. Why aren’t we advertising the position? I am sure there are a lot of people out there who are more than qualified and who would welcome an opportunity to fill this particular position, because it is a position of great importance to the Province and to the people of the Province. Why wouldn’t you advertise it? Why wouldn’t you just suggest that, yes, we are going down that path, let’s forget where we are today. I am sure Mr. Reynolds would understand. No one likes to be appointed to a position when they have gone through all of this and the commentary that has been made and the questions that are being raised. I am sure he would welcome it. Most people would welcome an opportunity to compete for a position and then let the chips fall where they may. Why not give this man a chance to compete for this job instead of appointing him to a job and then have all of these questions being raised about him. No one likes to have that happen to them. Let’s think about Mr. Reynolds here. The government should be thinking about what is best for him, as well as what is best for the Province and what is best for the people of the Province. When you are trying to fill this position of Chief Electoral Officer and Commissioner of Members’ Interests, put someone in there who can do the job in a non-partisan manner. You know, if Mr. Reynolds applies and there is an all-party committee that interviews him, and at the end of the day he wins that competition, then more power to him. At least he has gone through the process, like a judge would do, contrary to what the Member for Placentia & St. Mary’s has said. Let’s do it in the same way that we take care of our judges when we need to appoint a judge. Let’s go and do it in a responsible manner, instead of just suggesting we are going to appoint someone who has had a history with a political party, who is now being expected to take that hat off, put it aside, never to let it come into play again, never to let it influence any decisions he or she might have to make, never have questions raised about whether or not they can be non-partisan. We should not even be debating this today because it should be done in a manner that ensures that the individual who is going to fill this position is one who is non-partisan. We do not know that to be the case today. As I said before, I do not know Mr. Reynolds, and he may be quite capable of taking off that PC hat and laying it to one side, and when any issue arises in a provincial election, or in a by-election, when the votes are counted and it is close, that he will never do anything that will lead one to believe that he favours one party over another. Maybe he can, I do not know, but why should any of us have to doubt it? Why should any of us be put in this position where we doubt whether or not that non-partisan attitude will come into play? We do not know. It is not fair to us, it is not fair to the people of the Province and it not fair to Mr. Reynolds to be in this position today. It was completely avoidable, if the Premier had picked up the phone, called the Leader of the Opposition, and said: Why don’t we put in place an all-party committee? Why don’t we advertise the position? Is that something you think is a good thing to do? Because that is what I would like to do. We will advertise the position. We will see who is qualified out there, who is interested in applying. Then we will go through an interview process and we will get the best person possible to fill this job, the best person in the Province to be the Chief Electoral Officer, the best person to be the Commissioner of Members’ Interests. Pop quiz: Which approach is more likely to result in securing funding under a federal government funding program? (A) Actually applying for funding under that program. (B) Issuing a press release expressing "hope" for funding under that program. This isn't the sort of "hope" that Barack Obama espoused, even if he did draw his inspiration, so we are told, from Our Dear Premier. In Eddie Joyce’s defence – he was using nouns, not adjectives. He always has his mouth flapping over there but he does not have guts to stand up and say what is right or wrong. Stand up and criticize these figures. Do it if you are going to, if not stay quiet. I ask the hon. member if he would be a little bit sensitive to some of the language that he is using here in the House to refer to hon. members. I will just ask him if he would be kind enough to refer to hon. members as hon. members and not use some of the adjectives that he is presently using. Some senior Chinese planners and government officials are visiting the province this week. They want to learn about Canadian policies that involve public participation with urban planning. The cities of St. John's and Mount Pearl are hosting the visitors, and Susan Sherk of AMEC Earth and Environmental says they are focused on things like how smaller communities plan to use land, decide on lot sizes, and even how we go about collecting garbage. Sherk says the Chinese officials are looking to Newfoundland and Labrador as more like a university campus or laboratory, where that can work very closely with people here, something they wouldn't be able to do elsewhere. Sherk says what they are mainly interested in is the fact that we engage the public so much in our decision making. MR. DENINE: The hon. the Member for the Bay of Islands is continuously disrupting again, as usual. He has been a nuisance in the House. It is clearly unparliamentary to refer to another hon. member using the words just used by the Member for Mount Pearl and I ask them to withdraw the words immediately. MR. DENINE: Mr. Speaker, I withdraw that. Premier Danny Williams is very upbeat about the future. Premier Williams says consumer confidence is high and future job prospects for this province have never looked better. He says the recent announcement of another oil find off our coast is very significant and business optimism here is the highest in the country. Williams says consumer confidence is also very strong as people feel good about themselves and their future. He says the offshore continues to provide huge employment benefits; over 2.2-billion dollars will be spent at Long Harbour; the Lower Churchill project is making good progress, and the future has never looked brighter. Who was the Premier speaking to? When? Where? What was the purpose or occasion of his remarks? Ah, who cares. Five W's? Who needs 'em, even if reporting them would have made even the thinnest of news out of what is, instead, proselytizing for the official provincial religion, Optimism. There was a demonstration this morning near the closed paper mill in Grand Falls-Windsor. More than 60 former employees gathered for more than 90 minutes. Their beef is with the province. They say government has not been receptive to bridging the pensions of some workers, even though the province is now reaping the benefits of the power produced from the hydro facilities in Grand Falls-Windsor and Bishop's Falls. Workers say in many cases there would be severe penalties if they were to opt for their pensions now. Yip. Another great moment in recent Bow-Wow Parliamentary history. Seriously: beware the month of May. MR. SULLIVAN: A point of order. MR. RIDEOUT: Oh, what an idiot! Still more great moments in recent Bow-Wow Parliamentary history. And be forewarned: the worst decorum in the House seems to be in May-month. PREMIER WILLIAMS: - I prepared to lose the fishery if I did not get my way. I did not say that, Mr. Speaker. Under no circumstances did I say that. That is not what I said. The Member for Signal Hill-Quidi Vidi is hanging around with the Member for Exploits too long. He is getting just like him. He should practice good politics here in this Province and be responsible and ask proper questions. Give to me the words that I said exactly and I will give you an answer, Sir. I ask the Member for Bellevue if he would stand and withdraw the comment he just made. MR. BARRETT: Mr. Speaker, I withdraw and return at a later date. MR. SPEAKER: I ask the member to withdraw his comment unequivocally, without any commentary whatsoever. I ask the member, again, to withdraw his comment. MR. BARRETT: I withdraw, Mr. Speaker. Putting out press releases at twenty to seven on a long holiday weekend Logical Friday. "In any negotiation, there is give and take," added Premier Williams. Yet another great moment in recent Bow-Wow Parliamentary history. MR. GRIMES: The school board signed that, smartass. MR. E. BYRNE: A point of order, Mr. Chairman. MR. E. BYRNE: Everybody heard the Leader of the Opposition call one of the members over here a smartass. I would think that is unparliamentary, Mr. Chairman, and I ask you to ask him to withdraw the comment. I know, when we first got in, we were, when we were, y'know, basically trying to achieve efficiencies and savings, that we streamlined and cut that cabinet back to the best of our ability, but we've expanded it, not because of a preference just to bring people into cabinet, to be quite honest witya, it's to try and deal with the massive doodies and obligations that we have. 1) Is there any objective evidence at all that when We, The Provincial Government, first got in, we tried to achieve efficiences and savings? 2) Is there any evidence that We succeded? 3) Invoking the rule of opposites, if We, The Provincial Government, say that we've expanded it, not because of a preference just to bring people into cabinet, to be quite honest witya, then, in fact, we've expanded it, because of a preference just to bring people into cabinet, to be quite honest witya. First, in the initial media coverage, the Tely stood out as the most DW-focused. Not even VOCM framed the story as all about Danny. The Provincial Government is deeply disappointed that the Leader of the Newfoundland and Labrador Nurses’ Union is recommending the rejection of government’s lucrative and generous offer, which would have avoided a province-wide strike and negatively impacted patients. The province made substantial improvements to the original offer to nurses, for a total package worth an additional $70 million to the province’s approximately 5,000 nurses. "From day one in this lengthy process, union leadership has stated that pay and recruitment and retention are priority areas of concern and we have offered an extremely generous package to address those issues," said the Honourable Danny Williams, Premier of Newfoundland and Labrador. And, lest you have forgotten, Danny Williams represents, in his heart and soul, the hearts and souls of Newfoundlanders and Labradorians. If the story is about the province, its people, or its government, it's about Danny. And, applying the commutative principle, if Danny is disappointed, whether you realize it or not, whether you agree or not, so are you. Mr. Speaker, in a truly open and accountable and transparent government, there is never a question of being caught at anything. It is all there for the public to see at any particular point in time. When I was Leader of the Opposition, and my colleagues know, we did not voluntarily receive documents from this government when they were in government. It was not a matter of course that they passed over all kinds of documents to us. So it is a little two-faced, to say the least, to get on this way in questions. MR. PARSONS: A point of order regarding a matter that did occur during Question Period. Again, we are required under the rules to wait until Question Period is over to raise the point of order. I make reference to the Premier’s first response to the first question. I would submit that he used unparliamentary language. He said that the question put forward by the Leader of the Opposition and the actions of the Leader of the Opposition, he was being two-faced. Mr. Speaker, we are all aware - and you are certainly aware - that whether or not the use of a particular word is or is not unparliamentary can vary from time to time, depending upon the circumstances, the tone that was used at the time that it was uttered. I think it is quite clear, Mr. Speaker, that the use of the words - I have checked in Beauchesne here, I do not see the specific words two-faced here, but there are certainly lots of incidents in Beauchesne where that type of wording, saying that someone’s actions and behaviour is two-faced, certainly causes a negative connotation and is unparliamentary. I think the Premier should withdraw that remark as being unparliamentary. PREMIER WILLIAMS: I actually withdraw that remark, Mr. Speaker, that the Leader of the Opposition is, in fact, no-faced.